The train couldn’t get to New Hamburg fast enough. Photo by Daniel Case. As I was chatting with friends last night we fell upon the topic of people you’ve just met who make very outlandish statements and assume you’re on their side. These are almost always political or racist/homophobic/other -ist and never leave you in a comfortable position. 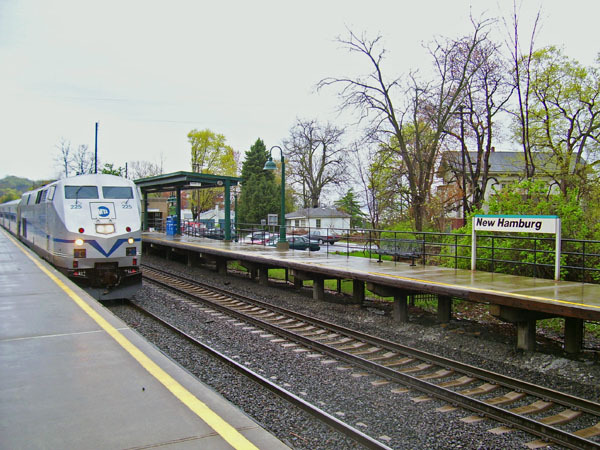 In Hightstown, NJ, this often takes the form of people casually turning the conversation to how they harbor a strong antipathy for the borough’s immigrant population. This is my tale of gay-related discomfort. It was either just before or just after I spent a year teaching abroad. I was without a car and had to depend on the train to go up to Fishkill to visit Mike and to return. This particular day I was actually meeting friends in the city while Mike was at work, so I called a taxi to transport me to the station. In the end I went with #3 and was extremely grateful when we soon arrived at the station. I made as quick an exit as I could and never mentioned to her that she had picked me up from my boyfriend’s apartment or that I was off to visit bisexual friends, but I felt charged with adrenaline as if I had been directly threatened. Looking back, I wonder if I missed an opportunity to challenge her views, but I don’t think she was very open to other points of view. And in cases such as this, it doesn’t seem wise to challenge a potentially unreasonable person piloting 2 tons of steel. You may be right about it not being a good time to rebuke this cab driver. I think there is a huge group of people, such as myself, that would like to better understand issues and problems from a gay perspective. There are dozens of things I would like to better understand but I get lumped into a generic pool of homophobic misogynistic rednecks. So I think its important to start a conversation with anyone who might be a little receptive. That’s an understandable fear and I’m sorry you get lumped in with the homophobes. What are you hoping to understand? I’m happy to try to help you out if I can. The most recent example would be I was reading about a softball team in a gay league that was disqualified for having to many straight players. I was completely perplexed. Not that there was a gay league. I assumed that they were leagues that were just started to create insure a gay friendly attitude. I had no idea that some were not inclusive to everyone who wants to play. I play on two softball teams and one baseball team. Our best player has been openly gay for as long as I have played. I would pitch a hot fit if we were ever disqualified or had to return our prize money because he is gay. That’s an entirely valid question, as the whole situation is very unusual. According to The Advocate, in an unusual turn an LGBT legal group has actually filed the suit on behalf of the straight players and against the gay league, because the league is allegedly still discriminating based on sexual orientation. My bet is the players are probably in the legal right, but if they actually are straight you do have to wonder why they’re playing in a gay league. Your example of your own league isn’t quite right because, if I understand correctly, it’s not a straight league so much as a “regular” one, and so anyone is welcome to join. But the gay league was set up specifically to give gay players a chance to play together, so it’s not really comparable. Just to be clear, I think the players are probably right that the league can’t discriminate, but from the outside it’s unclear to me why they joined in the first place. If they have a bunch of friends in the league and wanted to play with them I don’t think they should be barred, and if they’re just questioning their sexuality and seeking a safe place I certainly don’t believe they should be pushed out. And I certainly hope they’re not men who identify as somewhere in the LGBT alphabet soup the league doesn’t think is “gay enough.” But if none of those is the case, it’s all a little perplexing. It honestly had never crossed my mind to look at the leagues as gay, straight or regular before. I stumbled across the article while research the transgender fellow(can’t recall his name) that was playing for George Washington University’s women’s basketball team. Which lead me to Outsports.com. I was immediately blown away (and somewhat ashamed) that I was oblivious to many of the problems facing gay and lesbian athletes. Not being a fellow passenger, it’s hard to make a determination from this distance about how open this cab driver was to other points of view, but it seems to me (as a gay man) that there was an opportunity at the time she dropped you off and you’d paid your fee to say, “And by the way, I’m gay. Thanks for the conversation, but I hope you’ll reconsider your blanket condemnation of gay people. After all, I’m sure you wouldn’t enjoy all cab drivers being labeled offensive bigots.” It might not hurt to remind her (ilk) that not everyone, gay or straight, shares her religious point of view. If we won’t represent for ourselves, why should anyone else? That’s a very good point. I neglected to mention in the post she left me scrambling for the train (which I of course missed by about 30 seconds). Had that not been the case I’d like to think I would have done that, but then we do tend to look at ourselves in the most favorable light.